Yes today too is a magic day. Today too is a day to smile and be thankful that you are here. Not in any particular place, but just here on earth and breathing. I often think of what it must have been like to be in the midst of that madness that day. 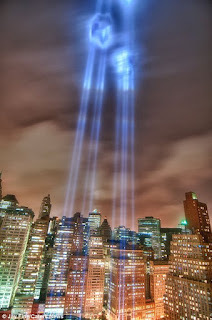 I was almost under the towers that day as well. Just two days before I had finished my rehearsal period for a musical that I was in. I literally walked past the towers every day at the exact time that the towers fell. So it gave me pause for a few weeks afterwards, but I kept repeating to myself, that it just was not my time. I am mesmerized by the support that surrounds this day in so many ways. I heard on the radio that just this week alone, there will be over 4 million people visiting the ground zero area. I was never comfortable with that name actually. It seemed to bring about an energy of nothingness, when actually that area is overflowing with love and support. Now I tell people that they have to visit the new Freedom Tower. It just sounds so much better in my opinion. I saw the tower yesterday and I was so proud to see that it is finally almost finished. There is so much money and influence surrounding that area that it is just too much to understand. This morning I felt as though I should do at least one thing for humanity, so I decided to do just that. What I did was a very simple thing that took very little effort on my part, yet made an incredible difference to two young ladies who were not from here. It is not important that I write what I did here because it may mute the actual message that I want to convey. All I can say is, they trusted me to make their lives a little bit less stressful during a particular moment and they were so grateful afterwards. So the question is, what can you do to be of help to humanity without expecting anything in return but the feeling that you get when you know that you have aided another person in some way.